Non-ambulatory cows will be checked to ensure that they have adequate food, water, and shelter (Critical Criteria). 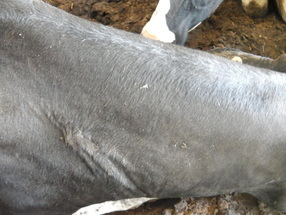 Non-ambulatory cows without sufficient access to water may become dehydrated. As dehydration is so rare, there is no corresponding test for this measure.